The safety of the baby has also been considered in the mobile home. including all the safety features necessary for our little guests, such as; safety plug covers, corner protection, cupboard/door locks and safety gate. 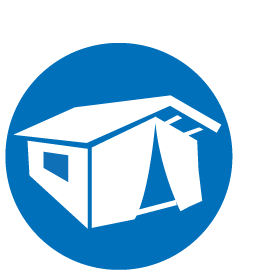 Of course, all Gusto Baby mobile homes include air conditioning and an extra-large wooden deck area, covering the entire length of the mobile. Outside the terrace is furnished with luxury garden furniture, a wooden canopy, offering protection during the hottest hours of the day or any eventual rainstorm. On the terrace is a children's play corner with soft matting and décor, completely secure with gate for comfort and safety purposes. This mobile home is only rented to families with at least 1 child till the age of 3 years. The layout of the mobile home Gusto baby is luxurious and comfortable. The modern kitchen of the mobile home has a gas stove, microwave and high fridge with freezer compartment and gives you the opportunity to cook a delicious Italian homemade dish. The bathroom has a spacious shower, sink and toilet. Off course the Gusto baby is including air conditioning and an extra-large wooden deck area with special children’s play corner with soft matting and décor. The baby's room contains a comfortable cot bed and changing unit with bath. The en-suite facilities ensure a perfect environment for bathing the baby in peace; changing and dressing in comfort. In addition the mobile home Gusto Baby is equipped with a baby monitor, night light, bottle warmer, high chair and buggy. The buggy is ideal if you want to walk a bit with your baby. In preseason and late season you can find many families with young children at all campsites , because there is a pleasant temperature for all young holiday guests. The temperature varies between 20-30 degrees Celsius. 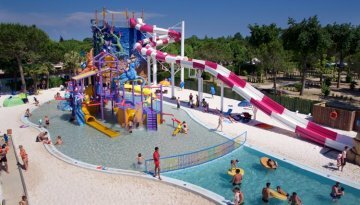 Campsite Pra’ delle Torri offers more than 4000 m² of water fun, off which a couple pools are specially aimed at babies and young children. There is a pirate ship in the middle of the pool where all children can play. The water depth of this swimming pool is ca. 30-40 cm. In addition is there a children’s pool with playground , where they can enjoy themselves. Campsite Spiaggia e Mare offers facilities for everyone. Although the children often have a leading role during the holiday, the parents can find peace and relaxation at this campsite. At the campsite is a day care , where the animations team will keep the little ones busy. In 2016 a giant ship has been built in the swimming pool surrounded with many water playgrounds. 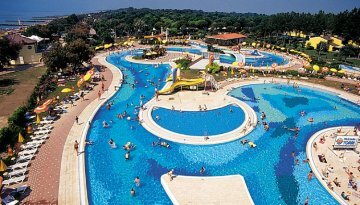 There is a big lagoon pool at Campsite Park Albatros where both the young children as adults can enjoy the nice water. There are 3 children’s pools with a soft bottom, ideal for the youngest holiday guests. At the campsite there is also a big shady playground with bouncers during high season. At the swimming pools of Campsite Bella Italia they thought of the little babies. For the young children is a separate child pool. Also there is Bel’s island, a water park full of playgrounds and water slides. It is developed for the younger children, so that they also can enjoy the refreshing water. Campsite Union Lido has a unique aqua park which includes aqua park Laguna. This pool has a (artificial) sandy beach with a slowly sloping bottom. There are play sets with small water slides , very suitable for all young children. Campsite Tahiti is a small but very cosy family campsite with approximately 300 pitches. 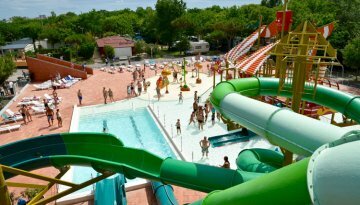 The campsite is located near the south Adriatic coast and suitable for families with young children. The parents can relax at the wellness centre of the campsite. At Campsite Marina di Venezia they thought about the younger children both in the swimming pool and at the beach. There are 2 children’s pools for the smaller swimmers among us. There is also a pool for toddlers, where they can enjoy the refreshing water. 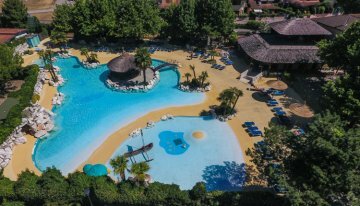 Parco acquatico: 9 piscine con scivoli! Animazione adatta a tutta la famiglia! 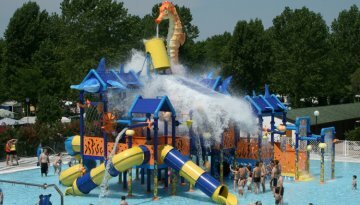 Grande parco acquatico sulla Spiaggia!